Get pre-approved: In a highly competitive housing market, it’s imperative to be pre-approved to give yourself the best chance of an offer being considered. Most realtors and sellers won’t even consider an offer with financing if a preapproval letter isn’t included. Choose a realtor that can help mitigate appraisal problems. A good realtor will meet the appraiser with the most current information in hand. As a local real estate expert often knows more than the appraiser, the realtor may have insight and information not readily available to the appraiser. Know your credit score: It’s not only important to have good credit and know your credit score, but equally important that your credit score stays the same throughout the escrow process. No big purchases, no opening numerous new credit lines and no late or missed payments. 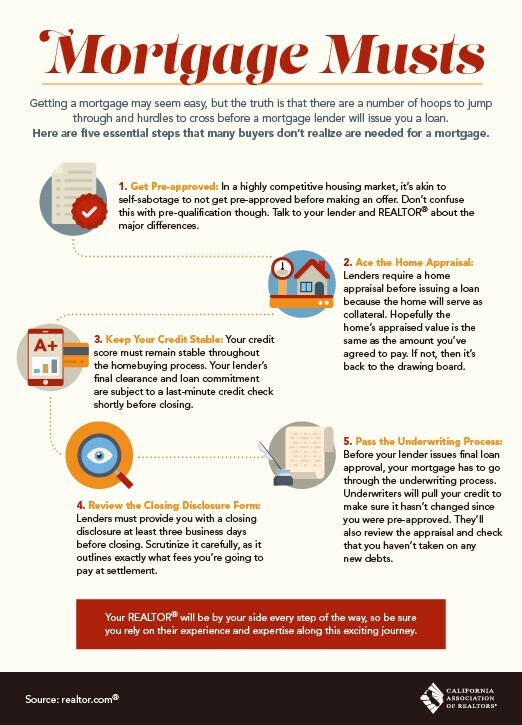 Make it through underwriting: Before you get loan clearance and final approval, your mortgage has to go through the underwriting process. Be ready and supply the underwriters with all requested documents quickly to avoid the stress of needing to ask the seller for extra time. Most loan contingency periods are 21 days or shorter so time is of the essence in the loan process. Review the closing disclosure forms or CD. Due to regulations, lenders must provide you with a closing disclosure at least 3 days before closing in order to see fees, details, etc. Many buyers are concerned with interest rates rising and that’s certainly valid as a higher interest rate means a higher monthly payment which most often means that you can’t afford a home you might have only months earlier. Taken in historical standpoint the current rates are dramatically lower than at just about any other time. 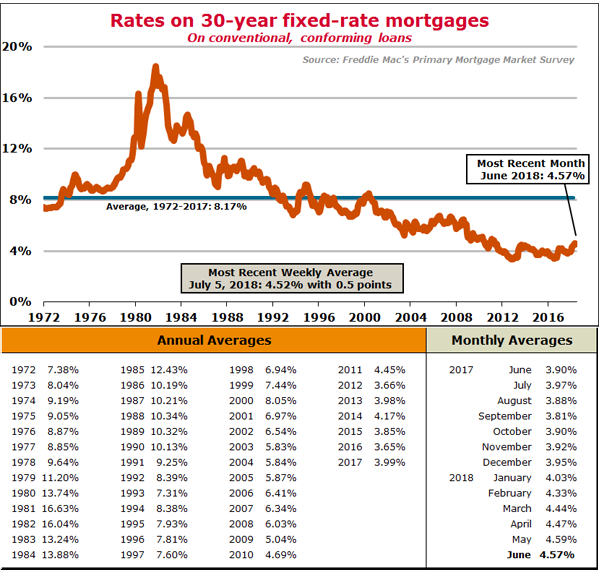 The chart below shows the interest rate on conventional and conforming 30 year fixed rate mortgages. As we’ll see we’ve basically seen rates drop consistently since the high water mark of 16.3% in 1981. It certainly makes todays current rate in the mid 4% range seem pretty enticing.